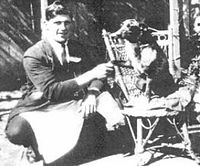 Bluey (7 June 1910 – 14 November 1939) was an Australian cattle dog owned by Les and Esma Hall of Rochester, Victoria, Australia. According to Guinness World Records, Bluey lived 29 years, 5 months and is the oldest dog ever verified. Two owners have made claims for longer-lived dogs Max and Bella, but these claims have not been independently verified. Bluey's age, along with that of "Chilla," a Labrador Retriever and Australian Cattle Dog mix, reported to have lived to the age of 32 years and 12 days, prompted a study of the longevity of the Australian Cattle Dog to examine if the breed might have exceptional longevity. The 100-dog survey yielded a mean longevity of 13.41 years with a standard deviation of 2.36 years. The study concluded that while the Australian Cattle Dogs do live almost a year longer than most dogs of other breeds in the same weight class on average, the cases of Bluey and Chilla should be regarded as uncharacteristic exceptions rather than as indicators of common longevity for this entire breed. ^ "Oldest dog". Guinness World Records. 2017. Retrieved 11 July 2017. ^ "Oldest-Living Creatures on Earth: Oldest Living Dog — Bluey". An entry. IP Factly. 6 June 2015. Retrieved 29 December 2015. ^ Knapton, Sarah (8 September 2008). "Oldest dog Bella the Labrador dies – aged 29". London: Telegraph. Retrieved 3 November 2010. ^ "The world's oldest dog dies at the age of 203 (in canine years)". London: Daily Mail. 9 September 2009. Retrieved 3 November 2010. ^ World's oldest pooch dies, Beaver County Times, 13 March 1984. Retrieved 9 May 2011. This page was last edited on 14 February 2019, at 23:38 (UTC).